I’m always trying to stay on top of what the best banks out there currently are, and where you can find the best bank rates currently in the market. I’ve written about quite a few banks here, including the one we currently have our cash stashed at, Ally Bank. We've been happy with Ally, but this past week I heard about another bank that has piqued my interest. Up until a couple of months I had never heard of Zions Bank. At first I thought that maybe they were a newer bank trying to capitalize on the slow savings market, but then after researching them a bit I read that they were founded way back in 1873, so they've got a bit of history. Now that they're offering a good rate of interest, and a good slate of account offerings, I thought I'd write about them here. Zion’s Savings Bank and Trust Company was started by Brigham Young on July 10, 1873. This became Utah’s first chartered savings bank and trust company. On April 22, 1960, The Church of Jesus Christ of Latter-day Saints decided to sell a majority of Zions First National Bank to Keystone Insurance and Investment Company. Zions First National Investment Company became the majority owner of the bank stock in Nevada on February 17, 1961. Still under the control of the Keystone group, the investment company became Zions Bancorporation in 1965. Zions Bancorporation went public for the first time in January 1966. There were some minority shareholders of Zions First National Bank, but in April 1972 all of the remaining shares were exchanged for Zions Bancorporation shares. Is Zions Bank Safe? Is My Money Insured? With Zions Bank your money will be safe and sound because the bank is FDIC insured. If you deposit your money and the bank goes under, you’ll be fine – as long as you don’t have more deposited than the FDIC insurance will cover. Currently that amount is $250,000 per depositor. I would never even consider a bank unless they were FDIC insured. Zions Bank has several different account types that you can get, but I’ll focus on three of them here – their savings, checking and money market accounts. The minimum to open a savings account is $100, which is about standard for a lot of these accounts. One thing that should be noted is that you’ll need to maintain a minimum balance of $1,000 in order to receive the maximum interest rate. That rate is currently at 1.01% APY – easily among the top interest rates in the nation as of the day this post was written. Free Checking – This is the standard free checking account with no monthly free, and a $100 minimum deposit. Free Interest Checking – This account will earn some interest along with giving you free checking, although it may not have all of the options of the other account. Direct deposit is required and there is a $100 minimum deposit. This account type is going to be similar to the online savings account. Sometimes a money market account will give you a better rate, but this particular one currently has the same 1.01% rate. Among the provisions of this account type is a $3 fee for withdrawals at a teller window, and that you can make up to six transfers within a 30-day period. There is an initial minimum deposit of $2,500. Opening an account with Zions bank is a 5 step process that you'll be done with in no time. First you select the account type that you want along with if you’ll have a joint account holder. 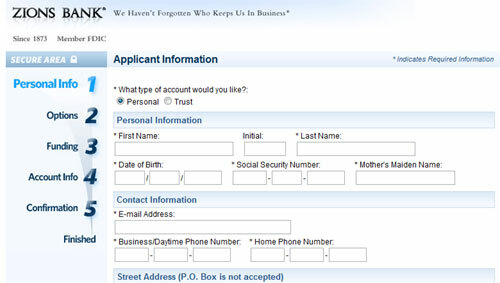 Then you enter your personal information including full name, date of birth and social security number. Next you choose account options and setup a linked account to fund your savings. After entering some final details you’ll receive confirmation of how to use your new account once it is approved. I’m told that your application for an account will be processed within two days and you’ll then be able to proceed and login online. No problem, and it sounds pretty comparable to opening an account with just about any other online bank. Open your account with Zions Bank. Click here for details! There are apps for Iphone, Ipod Touch, in addition to a ton of other smartphones. At the time that I wrote this, Zions Bank has some of the highest interest rates in the country and all of their accounts are FDIC insured. Add to that their other solid account options, mobile banking, no fees or minimums, good security and solid history, you’ve got a bank you can count on. 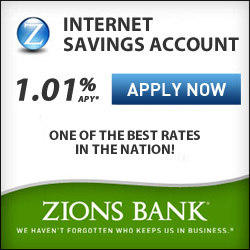 If you’re looking for a good high yield savings account where you can put your money, I think Zions Bank should be near the top of your list. To check out the details of their accounts, click on the links below. Do you have any experience with Zions Bank? Are you using them, and how do you like them? What are the pros and cons of their accounts? Leave us a note in the comments! Back when my mom sold her house, the Zion’s CD rates were 5.5%. We had a zion’s account for a few years. I was pretty happy with their customer service and their website was very user friendly. They will spam you with tons of other offers for credit cards and stuff.That was my only complaint. I’d use them again if rates went back up.